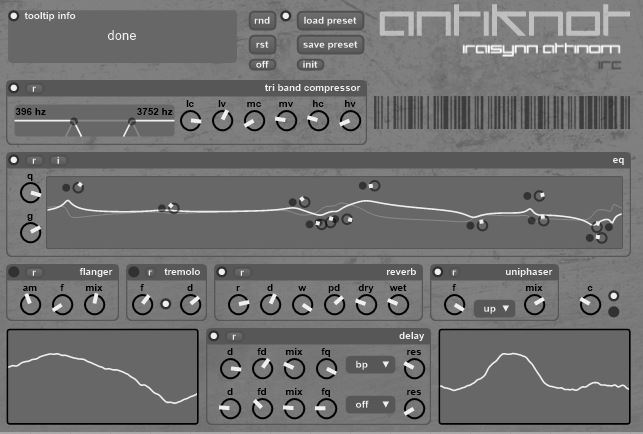 antiknot is a randomizable stereo signal processing effect featuring EQ, warm saturated tri band and single band compression, flanger, delay, reverb and uniphaser units. warm saturated tri-band and single-band compression, EQ, flanger, equalizer, tremolo, phaser, reverb, delay. Randomization function for the whole unit as well as the individual chain parts. Loudness protection / auto-gain function (no signal will be too loud or too quiet). Low CPU usage (full SSE and SSE2 support).